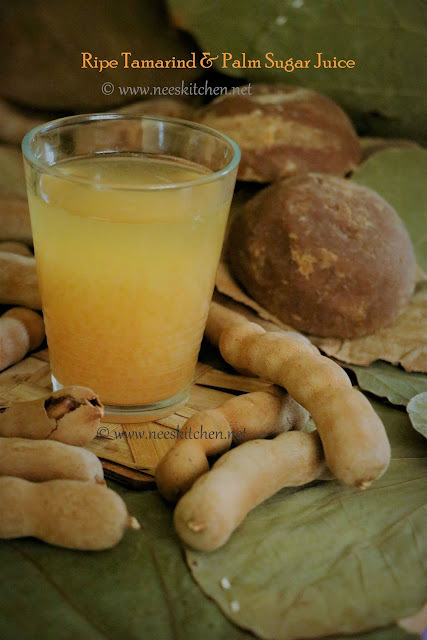 "Ripe Tamarind and Palm sugar juice" is a quick and easy thirst quencher. Navarathri is approaching and you can please your family and friends with this drink. Ripe tamarind has a good amount of iron content , thiamin and phosphorous. I got a packet of Ripe Tamarind & Palm during my recent visit to Bali. It has an equal proportion of sweet and sour taste. It is different from the regular Indian tamarind which we use for Sambhar and Rasam. Good for patients with heart disease. 2. Grate 2 inch ginger add it to the tamarind. 3. Take a heavy bottom vessel and heat 400 ml of water. Make it to boil. 4. To remove the line of seeds covered by the tamarind pulp, soak the tamarind in hot water for 2 hours. 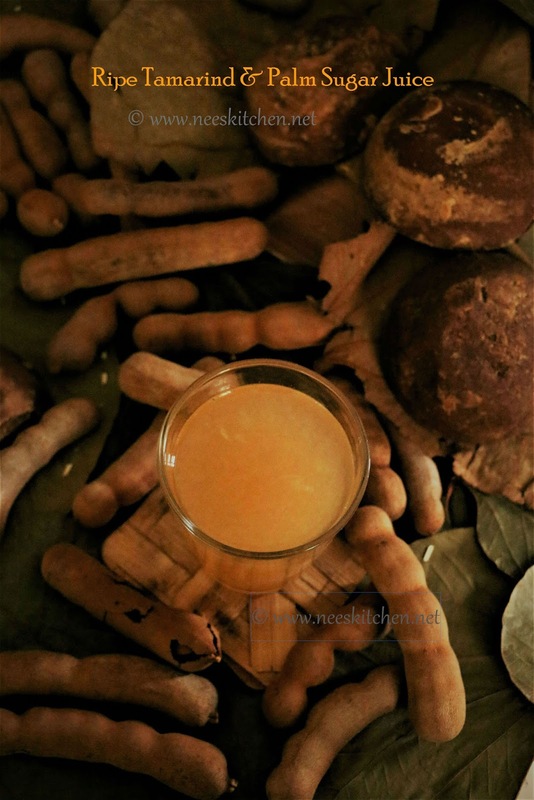 This also helps the ginger to get infused to the drink and you would not find any ginger pieces in the drink. 5. After 2 hours, extract the pulp by squeezing and straining with a filter. 6. Dilute the juice by adding 400ml of more water. 7. Add lemon juice, salt and grated palm sugar to the juice. Adjust the sweetness by adding more palm sugar. Salt is added to lower the acidity and it is optional. 8. Stir well. Pour into glasses and serve with ice cubes.